Poland’s Supreme Court said on Thursday (2 August) said it was suspending the forced early retirement of judges over the age of 65. It added that judges who want to should stay in place until the EU’s top court decides whether measures that will effectively allow the government to choose the court’s staff breach EU law. Court spokesman Justice Michał Laskowski said Polish President Andrzej Duda and the National Judiciary Council (KRS), which decides judicial appointments, should hold off from making any decisions about the court’s members pending the ECJ’s verdict. The justice ministry is expected to comment on the Supreme Court’s statement later in the day. “The Supreme Court has doubts and is presenting its doubts to an outside independent organ that was set up according to EU treaties to resolve such doubts,” Laskowski told reporters. 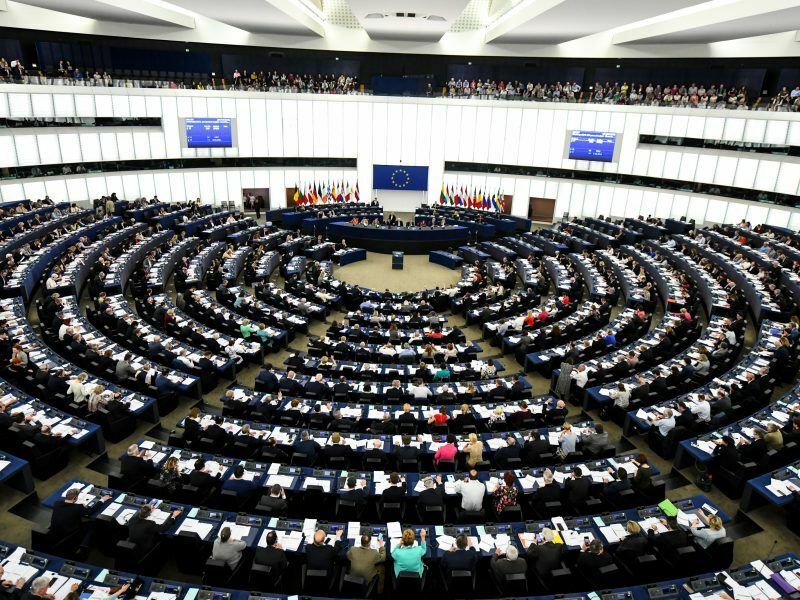 The Polish Senate approved the amendments to the Polish electoral law for the European elections in 2019 – an issue that could become another flashpoint in the rule of law dispute between Warsaw and Brussels. EURACTIV Poland reports. The president’s office immediately responded that the suspension had “no legal basis and has no effect on the president or any other organ”. The retirement law introduced by the ruling Law and Justice (PiS) party as part of a raft of controversial judicial reforms is at the centre of a dispute between the government and the European Union. PiS insists the judicial changes tackle corruption and overhaul a judicial system still haunted by Poland’s communist era. But the opposition, democracy watchdogs and the EU have warned they undermine judicial independence, the rule of law and democracy. The ECJ is assessing judicial reforms undertaken by the ruling Law and Justice (PiS) party since it came to power in Poland in 2015. Earlier this month, 22 Supreme Court judges – nearly one-third of the total – were forced into early retirement, but some have refused to go. They include the court’s chief judge Malgorzata Gersdorf, who says her constitutional term does not expire until 2020. The law allows the affected judges to ask the president to be able to continue to perform their duties, a decision taken by 16 judges. 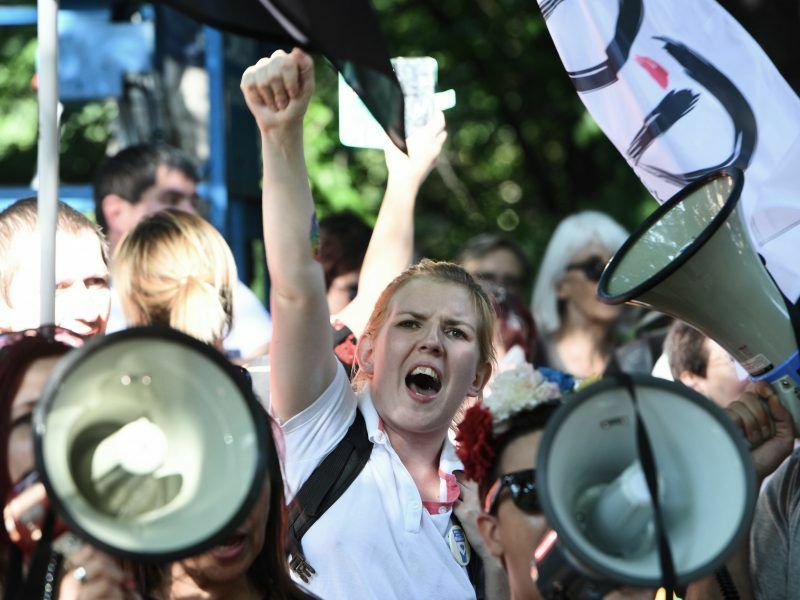 Thousands of people staged protests across Poland on Thursday (26 July) after President Andrzej Duda signed into law a measure effectively letting the government choose the next Supreme Court chief. 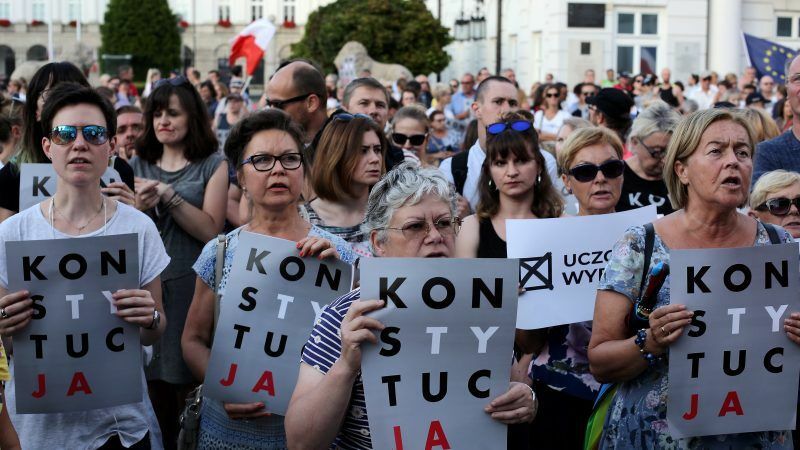 A measure signed into law by president Duda a week ago, as street protests were held across Poland, effectively lets the government choose the next head of the Supreme Court. The law allows the president, a PiS ally, to grant an extension to judges’ terms, while the KRS, whose members include politicians, can give an opinion on who is allowed to hold a judicial position. The EU, human rights groups and opposition parties in Poland say these measures and other changes pushed by PiS undermine judicial independence and democracy. The European Court of Justice (ECJ) yesterday (25 July) authorised EU members to refuse arrest warrants issued by Poland if they doubt defendants will get a fair trial there. Brussels triggered Article 7 proceedings against Poland in December 2017 over the judicial changes, which could eventually see Warsaw’s EU voting rights suspended. The EU also launched legal action against Poland over the Supreme Court retirement rules that could see the country receive financial sanctions. The retirement law came into effect last month and lowers the pension age of judges from 70 to 65.